This is a great party recipe. I think it will go over well at a barbecue. I made it for a tailgating party and everyone liked it. It is a Paula Deen recipe, but I had to make a few changes of my own with the Ranch seasoning and green onions, instead of red onions. Combine all of the ingredients, except the Fritos; stir until all are well coated with the mayonnaise. Place the ingredients in the refrigerator overnight. 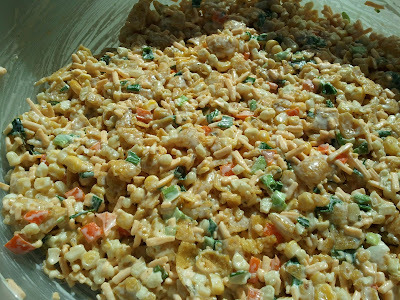 When you are ready to serve the “salad”, toss the Fritos into the mixture and serve. The fact that this recipe is for Frito Salad is funny, that’s why I put the word SALAD in quotes. As you can see from the ingredient list, it is NOT a salad, but it is Yummy! I am a Green Giant fan. You DO NOT have to use Green Giant corn for this recipe; a 15 oz. can of any other corn will work.